Kitesurfing lessons in Scotland during the winter? Yes we do! One of the most common misconceptions about kitesurfing in Scotland is that it’s too cold. Nothing further from the truth. Well, sort of. Here’s how we do it! A lot of us chooses to kitesurf in Scotland throughout the whole year. The main reason is that from late autumn through to spring we get the strongest winds. So for those loving their small kites this is the time to head out. Summer in Scotland can also deliver some really decent kitesurfing conditions. As much as this year has been a bit disappointing we do get a lot of very decent days. Typically for 9 and 12 meter kites, whilst during the autumn – spring period your 7 meter kites will be out of the bag quite often. As far as being cold this isn’t really an issue when you have the right gear. One of the key purchases should be a decent wetsuit. There are many cheap options on the market and even though they look like a good deal it always comes down to “you get what you’ve paid for”. Cheap suits not only will fall apart quickly, they also won’t be anywhere as warm as the proper ones. Even if the thickness, at least in theory, will be the same as the top brands. As a rule of thumb most of us use 5/3mm wetsuits all year round. Or 4/3mm during summer and 5/4mm during the winter months. The 5mm thickness is usually around your chest and back areas with thinner neoprene used on arms and legs to keep these areas more flexible. However, with newer wetsuits you will find that they are extremely light and flexible no matter what thickness you will go with. The ones we use ourselves are NP Combat 5/4 and NP Mission 5/3 wetsuits. The Combat works especially well during the winter due to the ArmourSkin very effectively deflecting the cold wind keeping you nice and toasty. The NP Mission works well during the winter too, it’s maybe a bit less warm but gives you more flex. Both can be used without any additional layers during most days out. If you use the Combat however, it’s good to have a late spring / summer wetsuit as this thing is super hot. During the colder days we also use hoods, gloves and boots. A standard 2mm or 3mm hood will keep your head nice and warm and 5mm boots are the standard most of us are using. You might not feel the board so well as you would when riding bare feet, but then again after couple of minutes you wouldn’t feel your feet when riding without the boots either. Gloves are a different ball game as everyone prefers something different. First of all make sure you get the right size. If you go too large, the water will fill in the finger tips and after being cooled by the wind you will get cold very quickly. If you’ll go too small you will get cramps from gloves being too tight. There’s also a matter of the type of a glove you can get. Some prefer to ride in 5 finger gloves. I always found them too cold and I could never find ones that would fit my hands properly. My choice were open palm mitts. Yes, the cold water gets inside but then you can easily pour it out. Also, you can blow some hot air on your hands which helps immensely. And let’s not kid ourselves – in the middle of the winter you won’t kitesurf in Scotland for more than 2 hours at a time. And during the milder days you’ll be fine in open palms anyway. It’s more to deflect the wind than anything else. Unlike the surfers we don’t paddle through the water. Our hands are getting really cold when they are on the bar from the wind. 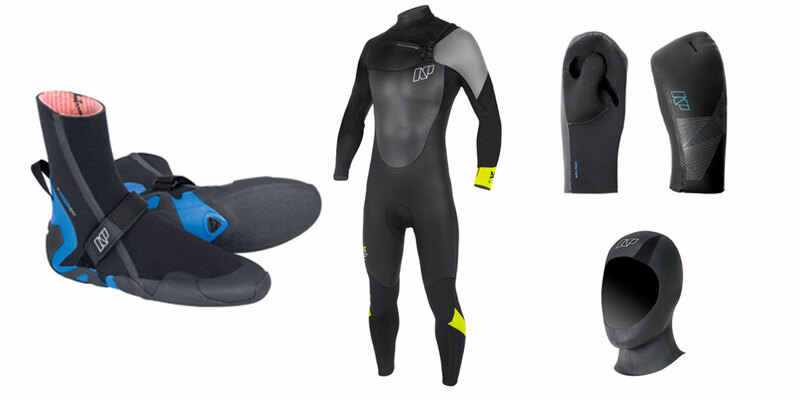 NP Combat 5/4 Wetsuit, NP Hood, NP Gloves, NP Mission 5mm Round Toe Boots. A decent kitesurfing session in Scotland during the winter is definitely worth putting some extra rubber on. Not only you can get out on the water no mater what time of the year but also you’ll have more space to ride. Not all kitesurfers are keen on changing in the cold (although you can always do this inside of your can with a of practice!) leaving us roomier playground. Also, riding during the winter makes you a bit more badass!